The 30-year-old has been active in the field and "sent out a signal fighting racism which extends beyond football," according to the jury who voted him as the winner of WDR radio's 1Live Krone. 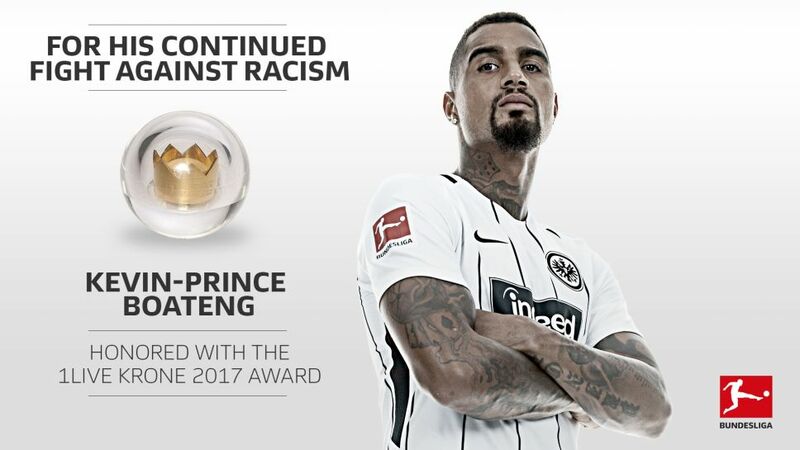 "To be given this award means that people are taking note and that there are still a lot of people who care about this issue," said Boateng, who joined Frankfurt in the summer. "That's really pleasing and I'm delighted to be getting through to more and more people and, with them, we are continuing the fight against racism." The award is being given for the 18th time and it is the first time it has gone to a footballer. Boateng led the fight against racism during his days as an AC Milan player, when he left the field during a pre-season friendly when he became the target for racist slurs. His team-mates joined him and the game was consequently abandoned, with the message conveyed around the world that racism in any shape and form is unacceptable. A few months later, the son of a Ghanaian father and German mother spoke at the United Nations about his exemplary actions, while he recently called on more to be done to identify and punish the minority who still make racist chants. "It's shameful," he said. "Such people should not warrant any attention; they must not be taken seriously." Thanks to Boateng's award-winning work, that is now becoming more common.